Greg Williams is a volunteer at East 119th Street Veterans Residence in Harlem, a permanent, supportive housing residence for former servicemen and women run by Volunteers of America-Greater New York (VOA-GNY). VOA-GNY is the largest provider of supportive housing for veterans in New York. For the past eight months, Greg has been organizing a monthly game tournament for formerly homeless veterans who now live at East 119th Veterans Residence. On every second Wednesday, in the cheery yellow recreation room decorated with murals that represent the different branches of the military, residents protect their king pieces with the loyalty of soldiers protecting their comrades – though the only Trouble they’ll experience here is a board game. As the tournament progresses, Greg advises players on what moves to make and he banters with his older peers as they playfully bark phrases to one another, conjuring a soundscape that transports you to boot camp. Raised in Harlem, Greg is a U.S. Army Reservist with the 333rd Military Police Brigade based out of Farmingdale, New York. He’s been in the Army for 10 years and has been deployed twice during that time. 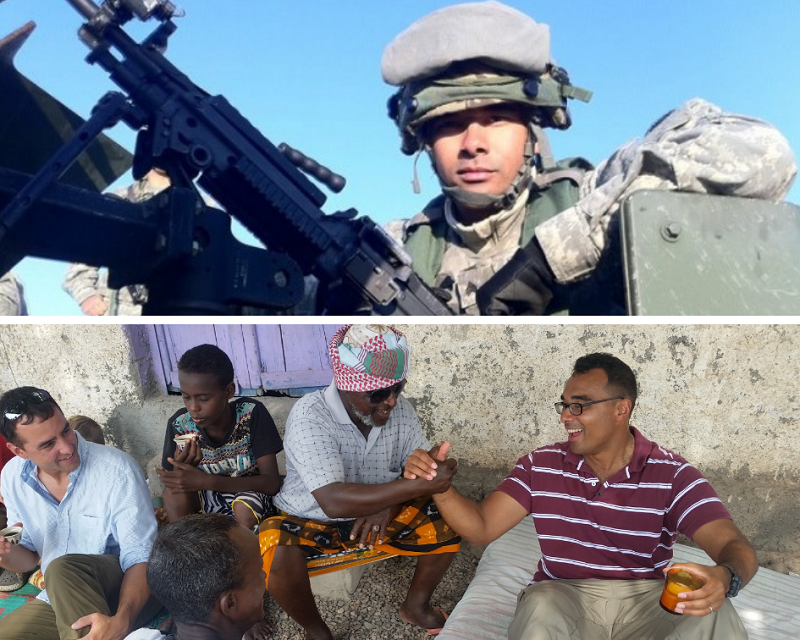 The Army has given him multiple opportunities to see the world, as he has traveled from Afghanistan, to the Horn of Africa, Macedonia, and France. As a Public Affairs Operations NCO, his job is to tell the Army’s story both at home and abroad. He does this in addition to his day job, family obligations, and belonging to Sigma Alpha Gamma Military Fraternity Inc., where his hours volunteering at East 119th Street Veterans Residence are counted as a part of his membership. Not only is VOA-GNY the largest provider of supportive housing for veterans in New York State, but nationally, Volunteers of America has been supporting vets since World War I. East 119th Street Veterans Residence is a 174-unit permanent, supportive housing residence for former military men and women. It provides safe, comfortable, low-cost housing and services to formerly homeless veterans, including those diagnosed with a mental illness. Residents receive case management, learn independent living skills, and receive substance abuse and behavioral health services through referrals. They also receive help navigating VA benefits, which can be a daunting task. Providing housing is part of VOA-GNY’s continuum of care for veterans, which addresses their employment, health, and reintegration needs, and now includes peer support programs. Beyond building relationships with fellow veterans who live in the community where he grew up, Greg benefits too. “Most people don’t understand what it means to serve. When I’m working with someone that I can relate to and they can relate to me, it makes me feel better. It’s therapeutic,” he says. The relationships that he’s built with the residents at East 119th Street Veterans Residence are fraternal; he describes them as older brothers joking around with a younger sibling. This is apparent if anyone visits on game day – there’s a lot of teasing but also an undercurrent of respect and comfort among the multiple generations of servicemen. In the recreation room, the hour is almost up. There is one chess match left to finish. The winner of the tournament gets a $25 gift card, and this month it’s for Starbucks. It’s a small treat that the competitors seem motivated to win. “Joes for the Joes,” Greg adds, smiling as he returns his attention back to his work. If you’d like to cultivate relationships within your community, talk to us about becoming a volunteer. Visit our opportunities page or email us at volunteers@voa-gny.org. Or, if you’re a veteran or active reserve member and would like to get involved with Sigma Alpha Gamma Inc., visit their website.